Essex & Herts Air Ambulance attended a male patient involved in a Road Traffic Collision in Westcliff-on-Sea. Essex & Herts Air Ambulance attended a male patient fall in Sawbridgeworth. Essex & Herts Air Ambulance attended a male patient involved in a Road Traffic Collision in Sundon. 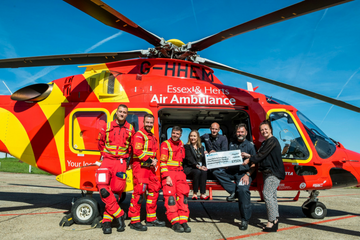 On 21st April 2019 an Essex & Herts Air Ambulance attended a male patient sport/leisure incident in Rushmere St Andrew. Essex & Herts Air Ambulance attended a male patient involved in a Road Traffic Collision in Rettendon. Essex & Herts Air Ambulance attended a male patient medical incident at Long Melford.